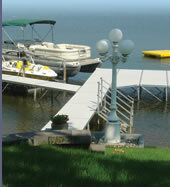 Shoreline Marine Contracting is the authorized dealer for Sunstream and Shorestation boat lifts. By offering both of these lift lines we are able to meet the demands of any customer. From hand cranked lifts to remote operated, solar powered hydraulic lifts we have the hoist to fit your needs. Both of these quality brands offer a wide range of leading industry products. This expansive product list insures that we have the right boat hoist for your needs. With our fleet of on the water boats and highly trained personnel, we are able to service any problem quickly and efficiently and get you back on the water.